Go watch this movie. Seriously. If you haven't seen it already then you missed out what I believe was the best movie of 2011. The plot, the aesthetics, the soundtrack, the actors,... everything this movie does, it does it the right way. But enough of the words of praise, let's get down to the details: It was the 11th of November, the weather was splendid yet somewhat chilly. My girlfriend and I where roaming the narrow streets of the beautiful old town of Ghent, when we came by this cosy little cinema and I promptly came up with the idea to watch a movie in English for my portfolio activities. My girlfriend accepted, mainly because of the outlook to get some popcorn, though. After having asked my best friend (a film school graduate) for advice which film to choose, we got two tickets for Drive and a large bag of popcorn. The intro already looks very promising, we see the protagonist, the Driver (whose name is not given in the movie, played by Ryan Gosling ), while he is moonlighting as a getaway-driver. His main reason to be a part-time getaway-driver is to get some extra money, and he follows strict rules: he never works twice for the same people, he shows up at the rendezvous-point in his car and will wait exactly for 5 minutes. If these 5 minutes run out he will make his getaway, with or without his contractors. During the intro of the movie, he helps two robbers to escape from the crime-scene, thereby demonstrating his excellent driving skills. The driver normally works in a garage and as a stunt driver for movies. His boss Shannon (played by Bryan Cranston) has connections with a local member of the organised crime, Bernie Rose, whom he tries to convince to lend him 300 000$ in order to buy a stock-car. Bernie insist on seeing the driver's performance first, and after the successful trial agrees to sponsor him. However, in the meantime the driver meets Irene (Carey Mulligan) and her son, Benicio, who live in the apartment next to his. He feels strongly attracted to Irene and develops a strong attachment to Benicio. They start to spend a lot of time together, but then Benicio's father, who had to serve time in jail, appears on the scene. Shortly thereafter the driver finds him lying in front of the elevator, severely beaten and bleeding. It turns out that Standard (yes that's his name), owes protection money to a local gangster, who wants him to rob a pawn shop. Standard refused for his family's sake, but they threatened to hurt Irene and Benicio the next time, so the driver offers him his help. From there on, things start to go pear-shaped: during the heist a mysterious car stops next to the driver's. Standard and his accomplice, a woman named Blanche, go into the pawn shop. Blanche comes out with the money, but when standard tries to escape, he is shot dead by the owner. The driver makes a dash for it but is followed by the mysterious car. After a harrowing car chase he manages to get away and they hide in a cheap motel, only to get attacked by even more gangsters. He somehow succeeds to escape, looking to find out whose money he has on the back seat of his car and how to protect the ones he holds dear. In order to avoid too many spoilers, I'll stop my account here. Personally, I liked the film so much because of it's authenticity, the credibility of the actors, the angst-laden love story and the captivating action-scenes. What I liked the most, though, was the fact that the cars, after being crashed, did not explode. 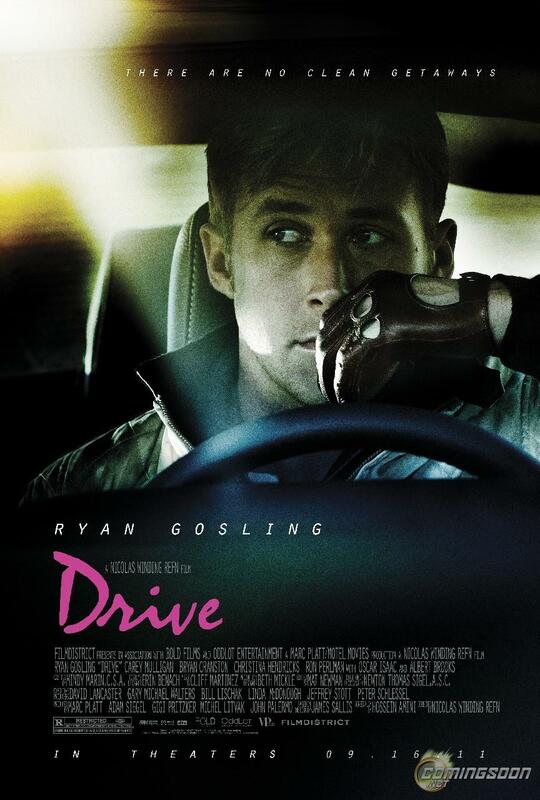 For those of you who are interested: Drive will be released on DVD (and Blu-ray) on January 30, 2012. I definitively think that the English unit should get a copy.